Hair is the most beautiful part of the body and if we do not caring, then they will become unsightly and lose their temperament. In hair care, we are use many of the ayurvedic remedies which are useful to overcome the hair disorders and reduced the growth of disease. Graying of hair is one of the most upsetting and problematic things for people in all over the world, especially for women. So, here we are discussing the top most ayurvedic remedies which is proven and succeeded in those problems. Nowadays, many products are available in the market, which includes cosmetic and chemicals like as ammonia etc. Use of these products is harmful to hair and increasing the hair disorders. We should be ignoring all the things that happened and step up for the solution. Some of the natural herbs which are useful in daily routine are help to treat with this problem. 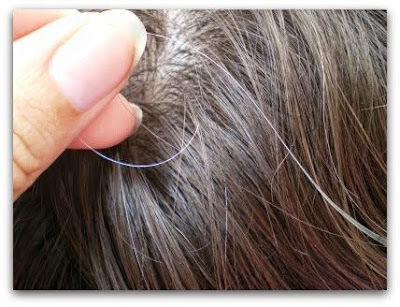 Also discuss about the causes for premature graying and its remedies. These remedies are effective similarly for both men and women. Excessive use of alcohol and smoking. Lack of physical exercises and meditation. Excessive intake of fried, oily and fast food. Excessive use of cosmetic soap, shampoo and oils. Excessive use of hair colors, which contains chemicals. Take juice of a lemon, two teaspoons of water and four teaspoons of Indian gooseberry (Amla) powder, mix them and make a paste. Keep it up to an hour. Now, the remedy is ready for use. Apply this paste on your scalp at least 20-25 minutes and it should be reached into hair root. Thereafter wash your hair with clean water. Remember that don’t use shampoo and soap, Avoid these things to get effect of remedy. You can increase the volume of this paste by adding more ingredients. Apply this paste on the scalp and hair roots. Be careful while washing hair it shouldn't go into eyes. Use of herbal (ayurvedic) shampoo, soap and oil would be a much better choice. Do massage this paste on your hair roots. Take four teaspoons of Indian gooseberry (Amla) powder and a dozen of basil leaves. Grind them and make a paste along with water. Keep it up to half an hour. Apply this paste on your scalp or hair root and leave it for half an hour. Thereafter wash it and also you can use hair oil. You should use it regularly until your hair will be converted into black permanently. Take equal amount of both henna and Amla powder and make a paste with water. Keep this paste up to an hour. Apply this paste on the scalp, hairs and hair root and leave it at least 2 hour. You can take some fresh amla juice and drink it regularly in the morning with Empty stomach. Also you should massage your hair root with this juice. Take some triphala powder and add some jiggery in it. Mix them well and use it. Take 6 gram of triphala powder with milk or water at every night. This is powerful and useful remedy to overcome white hair, use this method without caring of time because all the ayurvedic and natural treatments may take some time to get effective. Black tea is also very impressive to reduced white hair. Take 3 teaspoons of black tea, boil it and leave it to become cool. Apply this tea water on your scalp and then wash it after half an hour without soap and shampoo. This is a best alternative for teenagers. In this way they have quickly relief with premature graying. Take some curry leaves, boil them with coconut oil and filter it. Gently massage by this oil at your scalp and hair root. This method does best in this problem if it will be used regularly. Take some mustard oil and gently massage on hair root. Mix oil (mustard oil + amla oil) and massage on hair root. You can massage with any oil product is free from chemical factor. This oil is an effective option to treat gray hair. Take some dry amla pieces, boil them with coconut oil and filter it. Leave this oil for some time to become cool. Now, apply and massage by this oil on hair root. It is an effective remedy. Morning walk every day with barefoot on grass is very effective. Take more vitamins food and fruits. Drink enough water in your daily routine. Take nutrition diet and includes the green leafy vegetables and salad into your food. Do some exercises and yoga daily to get away from stress. Keep away stress by meditation. Wash the hair cleanly every time. Avoid the chemicals and cosmetic hair color and dye. If possible use only ayurvedic oil for massage. The combination of shikakai (Acacia concinna) and amla (Indian gooseberry) is also beneficial. Avoid salty, oily, spicy and fast food. Avoid drinking of alcohol and quit smoking. Ayurvedic remedies works slow, so this doesn't mean that not working. Keep patience and use them. Take healthy and protein diet. If necessary, then use soap and shampoo for wash the hair. Hoping that, you will get rid from all the hair diseases with these remedies. You also can comments for any suggestion or advice. Can I use only one remedy at a time or can I try one remedy one day and another remedy next day? You may try it, But using one remedy regularly is effective for positive results. Dear Sir, In Amla & lemon remedy can I take the dry amla pieces and powder them and use it. or should I use the Amla powder available in market (greenish in color)? And can i use henna powder soaked in tea water to color the hair temporarily (on some other day) while using this remedy? dear sir,i am 35.i hv been suffering for white hair at very early age and using various coularant (available in d mkt) for a long time.i know its genetiacally disorder for me.will d ayur treatment suggested by u be effective for me. Yes, you can use it....This method is more beneficial to you. If you gets black hair once then you can stopping the treatment. This is permanently cure from white hairs. my hair is started whitening at the age of 15, now my age is 29 unmarried almost white in head. Even if i get white hair in head i dont mind. But now my beard, mustache, chest (two white hairs) and even in eye lashes i found 2 of them are white. i know its my genetics problem. But why im getting very early. Also im working in software industry. Can it be cure through ayurvedic medicine? if so suggest me the best way to get cure.